Wealth-X presents “The Global Property Handbook”, in collaboration with Warburg Realtyand Barnes International Realty. The first edition of the “Global Property Handbook” reviews the luxury real estate market and explores the buying habits of the world’s wealthy. 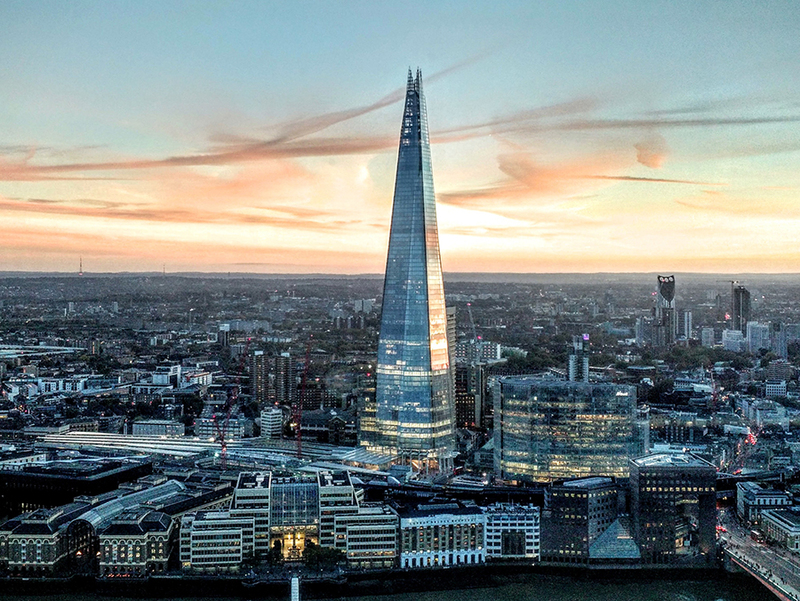 The report names London, New York and Tokyo as the most desirable cities in the world in which to purchase luxury property and singles out seven up-and-coming luxury real estate markets. The report reveals that 10% of ultra-high net worth (UHNW) individuals – those with a net worth of $30 million or more – own five properties or more. To help map these properties, the report includes the first-ever “Alpha Cities Index,” which ranks the overall attractiveness of a city for wealthy individuals when considering a luxury real estate purchase. The index is the first of its kind to incorporate the trifecta of demands from the wealthy—the ideal city property must satisfy a range of practical, emotional, and financial considerations. 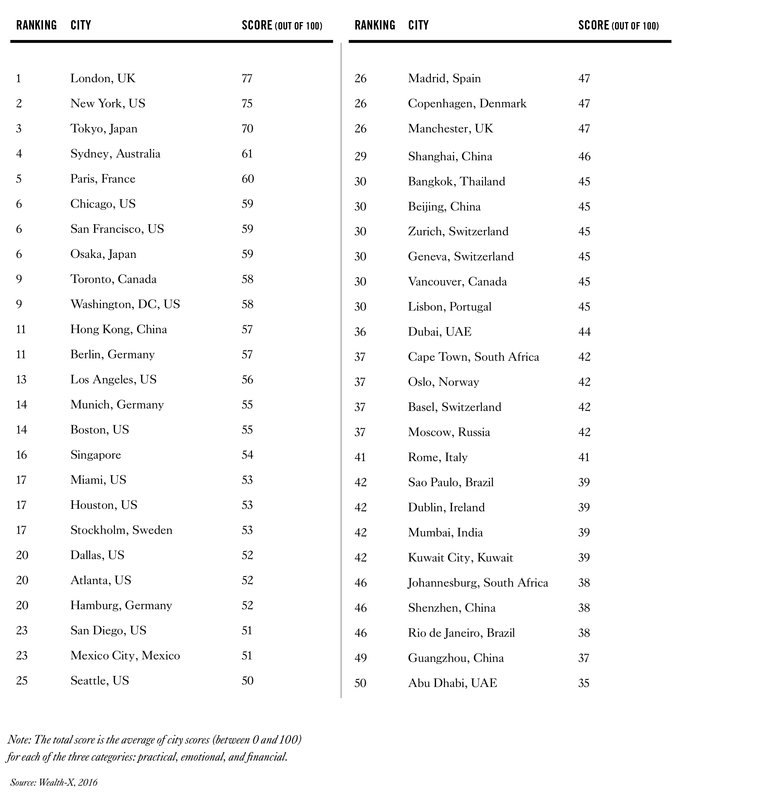 The report also features the Global Luxury Residential Property Index, which tracks the top 10% of the residential property market (by median sales price) since 2010. This year, the Index shows that prices peaked in 2015 and fell during the first half of 2016. As a result, only the properties with an optimal combination of practical, emotional, and financial benefits have continued to grow in value. Now that Dutch shipbuilder DAMEN, in cooperation with its luxury yacht builder AMELS has announced the sale of their second SeaXplorer 75—a stylish, sturdy and highly customized 246-foot-long expedition yacht that’s capable of breaking through polar ice (in addition to providing ultra-lux accommodations), it’s safe to say that ultra-lux expedition yachts are way more than just a passing fad. 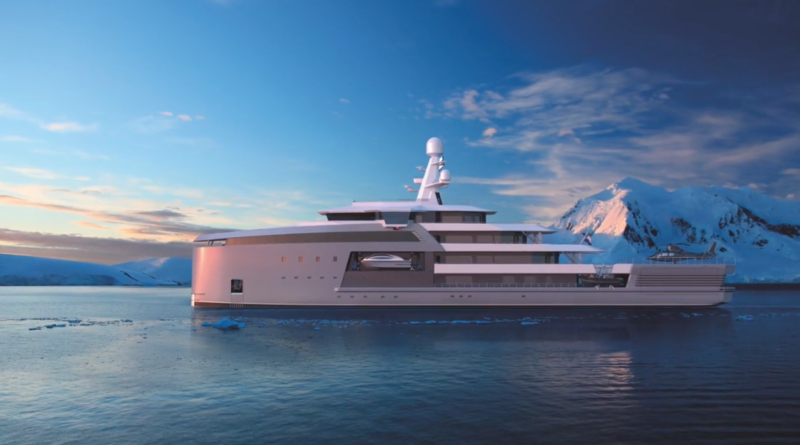 And now that I’ve returned from a mind-expanding trip to Antarctica aboard a much smaller (only 160-foot long) private yacht, it’s easy to see why some adventurous billionaires are opting to build expedition yachts like the SeaXplorer 75 rather than one of the many opulent superyachts cruising the Mediterranean this summer. The SeaXplorer 75 stands out because of its striking design. But it also stands out because of its capabilities. According to advanced reports, it will not only be equipped with a full dive center but it will also allow for two helicopters to take off and land on deck in addition to having full below-deckstorage for two helicopters as well. A large cabin at the bow is the perfect for a private whale watch in the lap of luxury. That’s why the owner requires two helicopters. Heli-skiing and heli-boarding in remote areas is hugely popular with those who have access to a helicopter. But even for the commercial operators flying from established helicopter bases with several aircraft the risks are significant. Then, when you take your own helicopter into remote mountainous (often poorly mapped) terrain, far out of range of the nearest rescue services, landing at high altitude in low temperatures and unpredictable turbulence, with the possibility of poor visibility, avalanches, and loose objects or equipment getting caught in downwash, having a back-up helicopter is more of a necessity than a luxury. But everything is relative and the SeaXplorer has no shortage of luxury features as well. The yacht is designed to accommodate 12 guests as well as 25 crew and expedition staff. The full custom interiors will feature the finest luxury quality and finishing created by the Owner’s choice of interior designer. The layout includes plenty of outdoor spaces for al fresco dining and enjoying the sun and sea, and the SeaXplorer’s unique bow point observation lounge with panoramic views, and seven luxurious suites on Main Deck and Upper Deck. Additional features that make the SeaXplorer 75 the perfect yacht for an owner who wants to go everywhere on Earth, and literally do everything when they get there include: a swim platform leading to the dive center, wellness center, sun deck hot tub, below-deck storage for jet skis, snowmobiles and a garage for 30-foot long party tender among other boats. Luxury brands have recognised the opportunity in voice technology to make exclusivity more accessible to their consumers. But the real challenge lies in inspiring new customer behaviour. Voice is the new interface into the world. From Amazon Echos to Apple HomePods and the Essential Home, there’s no question as to whether voice is applicable to the luxury world: it is. We know that we will be increasingly interacting with content via voice. Not in all situations, but in quite a few. Amazon have already reported a 10% growth between 2014-16 across total search and by 2023 the market is expected to grow five-fold. Fashion and luxury sectors have long been grappling with the dissonance between exclusivity and accessibility, with the digital revolution forcing brands to reassess their position thanks to the levelling effect of social media. With the adoption of voice command inevitable for luxury, the focus for brands should shift from avoidance, to creativity – how should we be thinking about utilising this new channel to encourage consumers to undertake the behaviours that we, as brands, want? We know that voice is set to be huge. L’Oreal expects 20% of total search to be done vocally in the next 18 months. Yet, when voice is part of an ecosystem where we get easier access to the things we want to know, we must not think about it in isolation. We must be part of this ecosystem of new customer behaviours, and carve out a set of behaviours appropriate for luxury; just like Amazon has done with encouraging users to use Alexa to search for music. There’s an opportunity to train people as to what they can ask of luxury. Taking a step back, in essence, voice is about accessing information you want using your voice. Currently, people are primarily using voice to either search or activate. It is used to ‘find’ and to ‘do’; very functional. Voice is really powerful for simple actions e.g. tell me the headline news story, set a timer, play a song. For the things that are part of our routine, voice is a wonderful innovation. It makes it easy to access things, and it gives you back very tangible and useful advice. Part of the change needed for luxury is to use voice in a way that provokes behaviours that we want luxury brands to be associated with – more discover, inspire, imagine, create, than open, find, get, locate. We haven’t yet reached the point where voice can reflect what the luxury sector is really about. Currently, if you ask Google to inspire you in the key passion areas the luxury sector relies on, it’s not very good at aggregating that in real time. Therefore, in its current state, Google won’t be able to reflect what luxury voice might need. This is an issue. For the luxury sector, we can lead. Luxury is the most emotive sector. It’s not just about access to information or adopting the newest fad. It’s about anything to do with self-expression, and not just a traditional sense of news. That’s where there is an opportunity. We need to help people find new value around self-expression, and move away from actions such as “Siri, do this for me”. The question for marketers is how do we use voice to allow people to express themselves and find value for brands to express all the new creative things they are doing? We are at the dawn of an age where we can inspire people in more fascinating and dynamic ways again. Content became all about listicles and ‘how tos’; we need to stop creating meaningless content and think about the actions and behaviours we are trying to provoke. The challenge now is to keep on top of customer behaviours. As we see voice emerge as a valuable behaviour, we have to ask ourselves, what are people asking Alexa? Where do we see new behaviours emerging? How can we add value to the experiences of these customers? What does the luxury sector train customers to do, sing, say, in order to add more value to those customers? Whilst this may mean something different for every single brand, what is certain is that the technology will keep getting better, so the behaviours we are going to be able to inspire are only set to get more accurate. Put simply, it is likely that voice is going to be the next generation of search. We are going to have to construct search strategies so that people are not only getting what they are looking for - visually and aurally, but more importantly for luxury and fashion, that people get what they aren’t looking for. You often don’t know what you are searching for until you see it. Editorial has always operated in this way, and even now, it’s status is under threat. People are crying out for creativity and inspiration instead of over-synthesised popularity pieces. In terms of the future, voice will only get bigger and simpler. For luxury, the biggest untapped opportunity is in a command that allows you to be inspired. There is not a voice command for ‘inspire’ at the moment; for things that are inspiring and interesting in real time. This is where luxury brands can play. Current news feeds, search, and messaging don’t satisfy the desire to be inspired that aspirational audiences crave. Likewise, we don’t just want another content idea for Instagram or for Twitter, we want one for how we just naturally think. How we speak. How we act. How we live. If we can create new behaviours for voice that adds to people’s experience, then we will be onto something quite exciting. For now, brands must focus on identifying what behaviours they want their consumers to have with voice, so that when the technology develops, luxury will be poised to inspire audiences in a way that is currently unimaginable. From here, the future has never looked louder. New York tops the list of must-visit places for a good reason. The city is a heady combination of 24-hour commerce, fascinating history and cutting-edge culture. Sunny and hot through to October, the city then turns into a winter wonderland by Christmas. Whenever you go, here’s our guide to a positive trip to the Big Apple. Our pick of New York’s many luxe hotel retreats is the Peninsula. Perfectly situated on Fifth Avenue and 55th Street in Midtown Manhattan, the 112-year-old institution is right in the heart of the city’s best shopping and entertainment district. It’s within strolling distance of Central Park, the Rockefeller Center and Broadway, but if you’re all walked out, make use of the complimentary Mini Coopers the hotel provides to guests – ideal for a day trip out of Manhattan. Central Park is Manhattan’s iconic green centre, running down the length of the island. Impossible to miss, pick a few areas (like Strawberry Fields) to explore. The High Line is another outdoor must-visit, a public park built on a historic freight rail line it runs above the streets on Manhattan’s West Side. Take a stroll and enjoy the leafy, elevated views over the city, or grab a spot on one of the many viewpoints with a coffee and a book. New York City is probably the most famous shopping destination in the world, with something out there for everyone. A must visit for any beauty fan is Kiehl’s flagship store, found in the East Village it’s on the site of its original apothecary that opened in 1851. The legendary New York department stores should also be on your list – pop along to Saks Fifth Avenue to discover a world of luxury fashion, including brand to trust Gabriela Hearst. The world-class museums also make the city a haven for the culturally curious. MOMA is our favourite for iconic contemporary art, not to mention the stunning architecture and great people-watching too. Or make a trip to the Met’s Costume Institute to explore its incredible collection of historical fashion. NYC’s always-evolving food scene is notoriously innovative. For a quick, yet healthy meal during a busy day head to Eat by Chloe for vegan fast food – the Guac Burger is a favourite of ManRepeller! For an evening treat, Blue Hill Farm has become renowned for its farm-to-table approach to fine dining. Choose the “Farmer’s Feast” for a six-course tasting menu that is inspired by the week’s harvest from local farms in New York and neighbouring Massachusetts. For a day of urban exploring, pair a statement tee with a cute miniskirt – a practical outfit that has just the right amount of edge. Throw on a classic biker jacket and choose a stylish backpack for carrying those everyday essentials. Come evening, opt for paper-bag waist trousers and a sleeveless blouse for a fashion-forward outfit that is sure to turn heads. Balance out this tailored look with a feminine heeled sandal and you’re ready for a night of cocktails and fine dining in the city that never sleeps. For $1 million, up to 10 guests (eight adults and two children) can transform the Southern Caribbean island of Calala Island into their own personal paradise for a week—complete with 25 dedicated staff members, ultra-exclusive experiences, and five-star dining. After being flown via private plane to Nicaragua from any starting city in the United States, guests will then be transferred to the Calala Island in two Bell helicopters. Once they touch down, the 11-acre island will become a no-fly zone, ensuring that guests will be able to let loose in complete privacy. After settling into the island’s four airy villas, guests will kick off a week of pure pleasure—indulging in unlimited fine wine and Dom Perignon, unwinding at the spa, and lounging on the island’s unbroken rim of sugary white sand beaches. Once guests have gotten their bearings, the island’s staff will be on hand to help facilitate the package’s over-the-top experiences—which range from a jaw-dropping $150,000 treasure hunt that pays homage to the island’s history as a popular pirate stopover, to unlimited scuba diving through pristine reefs and private fireworks shows. Guests will also be treated to one-of-a-kind culinary experiences, which include a fishing trip with the island’s guest sushi chef, caviar tastings, cooking master classes, and their very own cigar blend from world-class cigar maker Joya de Nicaragua. With luxury consumption dropping in 2016 to its lowest level since 2009, much attention has been focused on one of the biggest forces in global luxury spending: Chinese consumers. As the Chinese economy slows, and growth in luxury consumption cools in China and abroad, there’s a growing concern among industry observers that Chinese consumers are losing their passion for luxury goods. The importance of China for the luxury-goods market is best shown through some statistics. The number of Chinese millionaires is expected to surpass that of any other nation by 2018, and by 2021 China is expected to have the most affluent households in the world. In 2016, we estimate that 7.6 million Chinese households purchased luxury goods—a number larger than the total number of households in Malaysia or in the Netherlands. Each of these 7.6 million households spends on average RMB 71,000 in luxury goods per year—which is twice what French or Italian households are spending. Chinese luxury consumers thus account for over RMB 500 billion ($7.4 billion) in annual spending, representing almost a third of the global luxury market. In 2008, when China hosted the Olympics in Beijing, Chinese consumers accounted for only 12 percent of global luxury spending. In the eight years that followed, we estimate that more than 75 percent of the total growth in global luxury spending, over $65 billion, could be attributed to purchases made by Chinese consumers, either at home or abroad. From 2008 to 2014, the number of Chinese households purchasing luxury products doubled, fueled by growing incomes and greater access to luxury goods. Since 2015, the primary driver of increases in luxury spending has shifted from consumers making their first purchases of luxury goods to incremental spending from existing luxury consumers. This transition means that luxury-goods players need to invest more in building loyalty among existing customers than recruiting new ones. Along with the shift from customer recruitment to customer retention, the profile of Chinese luxury consumers has also been evolving. In the past, luxury consumers in China were mainly comprised of those belonging to upper-income households, which we define as households earning RMB 100,000 to RMB 300,000. Through our research, we’ve observed the increased importance of wealthy Chinese, or those with household income in excess of RMB 300,000. In 2008, wealthy Chinese represented only a third of Chinese luxury consumers; today they represent half of the shoppers in this category and account for 88 percent of Chinese luxury spend. Compared with average Chinese consumers, wealthy consumers report a much more positive outlook about their future spending: one out of two wealthy consumers expects to spend more in 2017, while only one in four average Chinese consumers plans to spend more. Bolstered by their confident outlook, we expect wealthy consumers will be looking to trade up, either to more expensive brands or to more expensive products from their current brand. 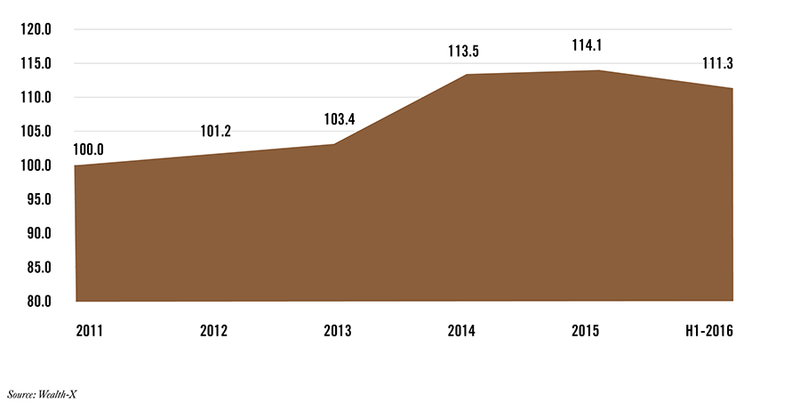 We expect incremental spending from existing wealthy consumers to account for over half of the anticipated growth in Chinese luxury spending from 2016 to 2025. By 2025, we forecast the value of the global luxury-goods market to climb to RMB 2.7 trillion, with RMB 1.0 trillion being added over the next nine years. As they have in the past, Chinese consumers will account for a majority of this growth, and by 2025 will account for 44 percent of the total global market. Wealthy Chinese will represent a major force behind this increase in luxury spending. By 2025, 7.6 million Chinese households will represent RMB 1 trillion in global luxury sales, an amount that is double that of 2016, and equivalent to the size in 2016 of the French, Italian, Japanese, UK, and US markets combined. Wealthy Chinese consumers are heavy spenders, spending on average RMB 71,000 annually on luxury goods; 38 percent of them spend more than RMB 100,000 annually. This number has been increasing by more than 5 percent a year since 2010. In addition to increasing their spending, they have become much more impulsive in the way they shop for luxury goods: one in two of their purchases are decided within a single day. This represents a major shift in behavior: back in 2010, only one luxury bag in four was purchased with only a day’s deliberation. This trend is consistent across categories of luxury goods we studied. As wealthy Chinese luxury consumers have become more impulsive, the role of word of mouth has gained in importance. We found that 30 percent of luxury purchases are directly influenced by word of mouth, up from only 14 percent in 2010. Word of mouth from friends and family is now the number-one factor influencing purchase decisions, ranking above the in-store experience. Related to growing impulsiveness is the importance of the initial consideration phase in consumers’ decision journeys, specifically the brands that consumers consider top of mind before they actively gather information. Of the three brands considered for luxury purchase, two are considered top of mind and are the ones that consumers actually buy on 93 percent of their purchasing occasions. While affluent Chinese consumers might purchase a brand they did not initially consider, wealthy Chinese are unlikely to purchase luxury goods that don’t fall within the two brands they consider top of mind. “Timeless styles” has also emerged as a key driver of luxury purchase decisions, surpassing “innovative designs” in relative importance. China is home to some of the most innovative digital services and platforms, such as WeChat and TMall. Chinese consumers are avid users of social media, and 35 percent of them generate online content on a daily basis. But this has yet to translate into online purchases of luxury: only 7 percent of Chinese luxury sales occur in official online channels. We don’t expect this situation to change much in the near future, as only 16 percent of wealthy Chinese luxury consumers expect to increase their online luxury spending in 2017. Nevertheless, as luxury brands further develop “O2O” initiatives that bridge the online and offline worlds to create a seamless experience, it is likely that more luxury sales will be conducted online. With 5.9 international trips on average per year, wealthy Chinese accounted for a major share of China’s outbound travel. Shopping is cited as the primary reason for these consumers’ choice of travel destination, and when they shop overseas, Hong Kong remains their top destination, followed by South Korea and Japan. Price remains a key factor determining whether a wealthy consumer makes a luxury purchase at home or overseas, and they are becoming less tolerant of disparities in prices. In 2012, 60 percent of consumers were willing to accept a 20 percent price markup on luxury products sold in China. Today, only 20 percent of consumers tolerate such markups. Surprisingly, only 70 percent of them would choose to purchase luxury goods in China if offered similar prices to overseas outlets. This phenomenon is a reflection of how dissatisfied wealthy Chinese consumers are when it comes to purchasing luxury goods at home. Compared with their luxury buying experiences overseas, wealthy consumers are less satisfied with product assortment, the in-store experience, and the quality of customer service they receive when purchasing luxury goods at home. Given how unsatisfied wealthy consumers are with their luxury experience at home, it’s not surprising to see them shift their purchases overseas. Between 2008 and 2016, overseas luxury purchases increased from two-thirds to three-quarters in terms of spending value. Yet, over the same period, we’ve observed a growing mismatch between demand and supply of luxury in China. Despite the boom in overseas luxury spending and flagging demand at home, the number of luxury stores in Mainland China increased by 3.3 times from 2008 to 2016, while domestic sales increased by only 2.3 times. In addition to the rise in the number of Mainland retail stores, we found that 80 percent of luxury stores are located in the top 15 Chinese cities as measured by GDP. Yet these cities are home to only 25 percent of wealthy Chinese consumers of luxury, revealing a clear mismatch between the presence of luxury brands and the demand for their products. These findings suggest some paths forward for luxury players. Two areas are of particular interest. But consistency is only one part of the equation. To become an integral part of the travel plans of wealthy Chinese, luxury brands will need to craft a much more appealing experience for these highly demanding consumers. One of the most powerful ways to achieve this is through store design. Luxury brands should invest in unique store designs, adapt store-design guidelines to the designs taught in local architecture schools, and create distinctive store atmospheres. Another way to appeal to global customers might be to offer a handful of products that are only available at certain stores. They could also offer locally tailored products that serve as luxury souvenirs. Local events could be another way to attract traveling consumers. Inviting a local sports team into the store, or holding an event at an iconic venue in the city, are just a couple examples of such events. Redesigning the stores’ footprint and segmentation. Given current Mainland market dynamics, luxury brands should assume that not all their Chinese stores should focus on selling. They could think about assigning clear roles to the different stores—from image-building flagship stores to stores focused on generating sales, or stores that serve primarily as relationship touchpoints. Such a revised segmentation might require revisiting—and redesigning—the formats of existing stores. Connecting with customers outside the stores. With 75 percent of potential consumers living outside of the top 15 cities in China, it seems difficult to conceive of a world where luxury brands could establish stores to reach them all. As a result, connecting beyond the store, like organizing brand events in cities without any store presence, matters. Another idea would be to establish new brand touchpoints in Tier 2 and 3 cities that have little potential for new store openings. For example, they might open “brand apartments” that combine the elements of a luxury showroom with the experience of a café or bar. Another idea that might resonate with core customers might be developing a VIP social network to stay in touch with these customers virtually. Chinese consumers are not losing their passion for luxury goods. They will continue to expand their spending in luxury goods and maintain their leading role in the growth of the global luxury-goods market. And the most wealthy of them will play a central role in this. Yet, with the rising sophistication and growing complexity in the shopping behavior of wealthy Chinese consumers, luxury brands won’t capture these highly valuable and discerning customers by doing more of the same. They’ll need to undertake a complete rethink of how they address Chinese luxury consumers at home. This will require moving from a “sales push” model to building long-lasting relationships at home, while crafting strategies that will make them an integrated part of wealthy travelers’ itineraries abroad. In the 15th century, Leonardo Da Vinci was one of the first who recognized birds gliding very easily and effortlessly over the water, once they have succeeded to enter into gliding. The ConceptFLYSHIP realizes the vision of almost weightless flight directly above sealevel.We are 26 experts who are developing high-tech-ships, which operate based on the physical phenomenal of the ground effect. Our Flyships have two major benefits:They are ten times faster than the average ship at this size (250 km/h)They only need half of the fuelPrimary we are offering them as highspeed-ferries and private yachts, but there are many other possibilities. 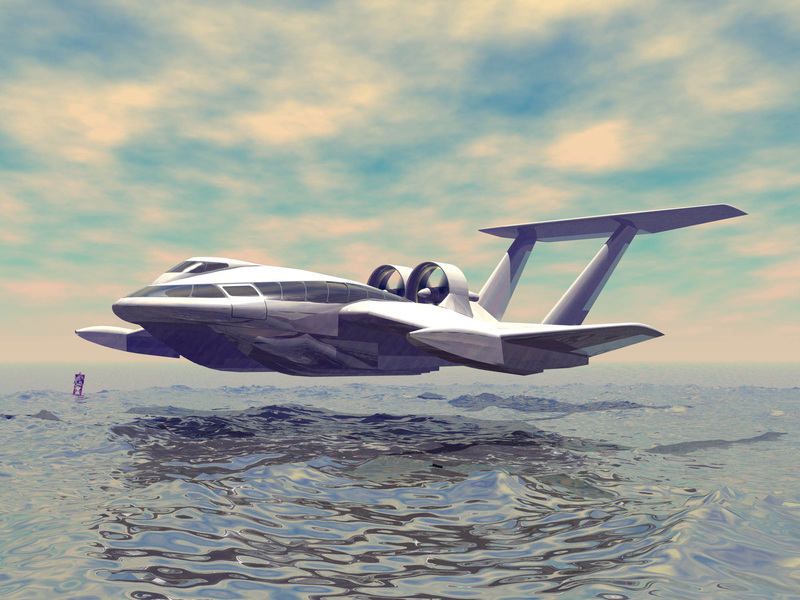 FLYSHIP is the marketleader in ground effect vehicles. 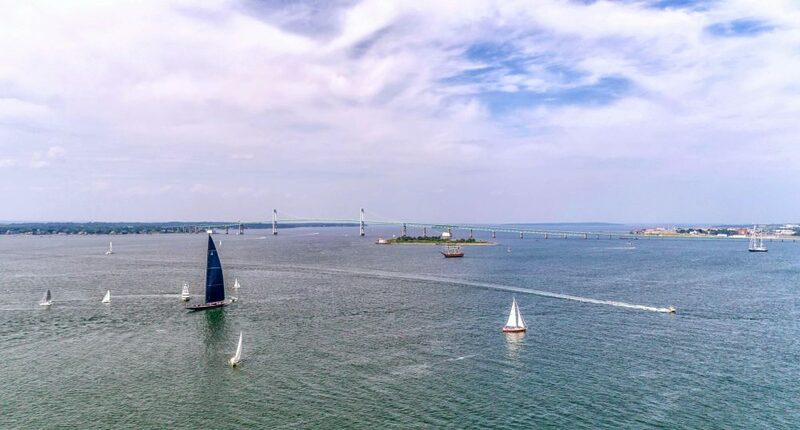 Newport is hosting a first in the sailing world this week: the J Class World Championship. J Class yachts are rare, and they’re huge. Picture a sailboat about as long as a basketball court racing around Newport harbor. These impressive boats will be on the water through Saturday. J Class boats are different from the high-tech carbon-fiber catamarans used in modern-day racing. These long, wooden yachts are a throwback to the America’s Cup races of the early 20th century. “At their time, in the 1920s and '30s, they were the absolute bleeding edge of yacht design, of crewing ability, of sail design,” said Andy Green, a highly sought-after race announcer in the sailing world. “These boats have been coming up here for the season of racing for 100 years." The boats are refurbished originals or new constructions built using jazz-age designs. Today there are only 11 official J Class boats in existence. Six of them are in Newport. These slender boats are longer than a tennis court. They’re sleek and sit low to the water. It’s a dramatic sight: a massive boat leaning at a 45-degree angle toward the water as its sails catch the wind. A boat can look like it’s about to capsize. It probably would if not for the crew members, who must run to the opposite side of the boat to counterbalance the vessel. 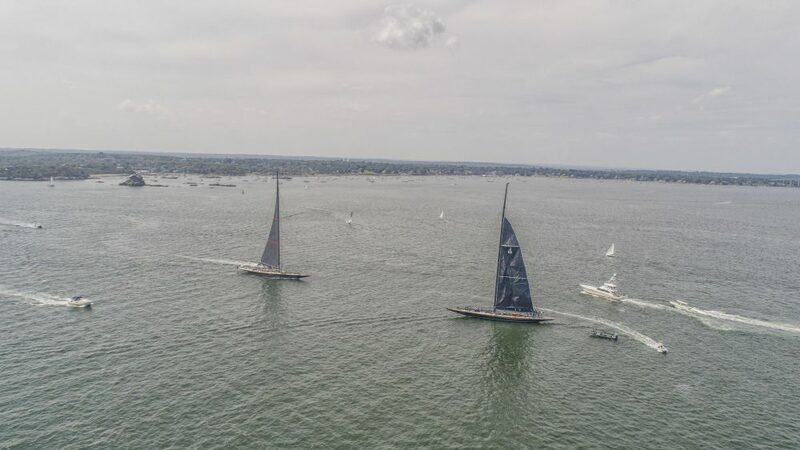 J Class boats present a unique challenge to racers like Read, who typically compete on zippy, carbon-fiber catamarans. Speed is not what makes this race dramatic. The boats will only reach a top speed of about 12 knots — around 13 miles per hour. The real spectacle is the size of the boats, and the dozens of people it takes to race them. Read says it’s strenuous, athletic work. And there’s the real possibility a sailor could fall overboard. Then there’s the force exerted by the wind, the ocean, and the crew physically pulling on the boat as it moves through the water. “We’re not naive enough to understand that when you’re talking about the loads on these boats, massive loads, if you’re not in the right spot at the right time, people can get hurt, so we also take the safety aspect of it very seriously,” Read said. 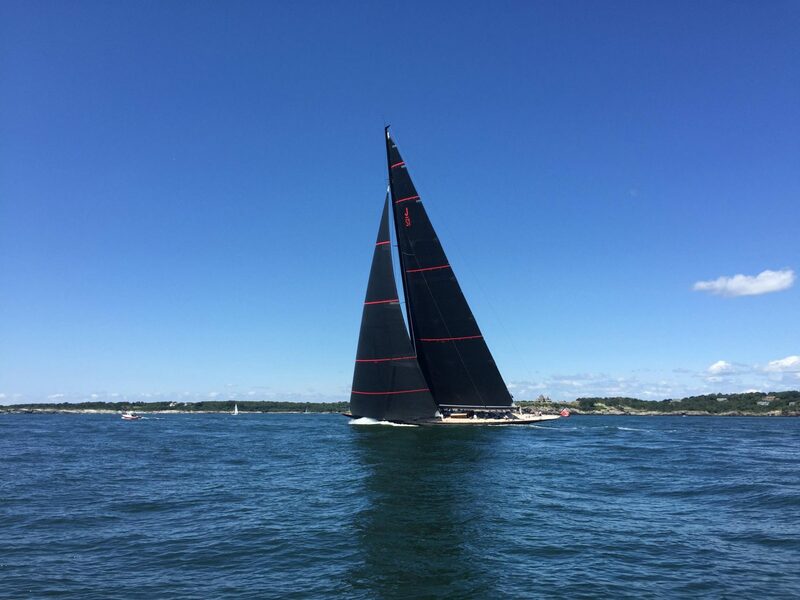 On a dazzlingly bright day before the start of the championships, in a much smaller boat, Green, the race announcer, motored out of Newport harbor. On race days, no one else will be allowed out here. In fact, smaller boats will be on the water clearing the course for the J Boats. But Green said spectators will still get a great view from land. Read says events like these are an economic boon to the tourism industry, and they celebrate the natural beauty of the ocean. Sailing may not have the mass popular appeal of football or baseball. And many people won’t have the opportunity to step aboard boats like these, but the event is free to watch for anyone who can get to the shoreline.